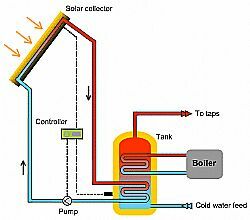 Solar thermal collectors use free heat from the sun to warm domestic hot water. A conventional boiler or immersion heater is then used to make the water hotter if required, or to provide hot water when the sun is not shining! Typically users have reported that solar collectors in Lochaber will provide about 50% of the annual hot water required, operating effectively between March and September. A typical installation for a family home would comprise 2x2m collectors situated on a roof facing SE-SW, best of all facing due south, producing a total of 1800kWh/year. If insufficient roof space is available then collectors can be situated in a garden as long as it is large enough to avoid shading from neighboring properties, trees, etc. The most common type of solar collector is the flat plate type.These are constructed from a meandering copper tube lying on a bed of thermal insulation, all encased in an aluminium frame and overlaid with special glass. 4m2 flat panels plus a twin coil cylinder cost in the region of £3-4,000 plus VAT (5%). Another type of solar collector is the evacuated tube, which is more efficient and therefore requires less space, but is more fragile and expensive than flat plates. 3m2 evacuated tubes plus twin coil cylinder cost approximately £3,500 – 4,500 plus VAT (5%). Do you have a sunny place to put solar collectors? You will need around 5m2 of roof space which faces east to west through south and receives direct sunlight for the main part of the day. Alternatively, if you do not have a south facing roof, you could install two collectors, one facing east and one facing west – but this will increase the cost of installation. The collectors can also be fixed to a frame on a flat roof. Most conventional boiler and hot water systems are compatible with solar water heating. If your boiler is a combination (combi) boiler and you do not have a hot water tank then a solar hot water system might not be compatible. Solar hot water systems will be eligible for RHI payments, but only if an MCS approved system and installer have been used.